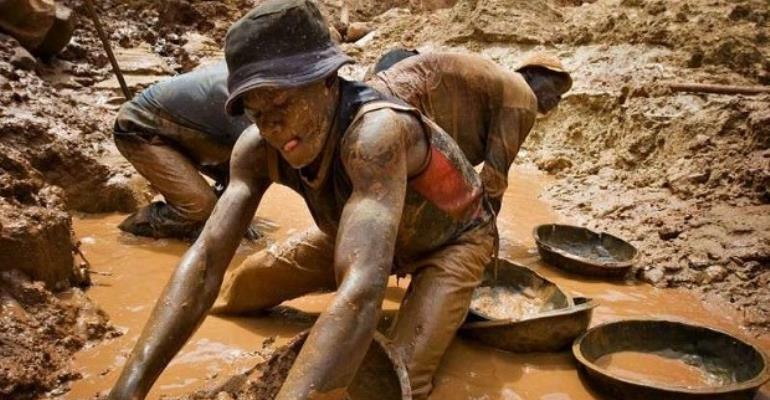 The Ghana National Association of Small Scale Miners (GNASSM) is infuriated about government’s delay in lifting the ban on small scale mining in the country. The Association finds it logically difficult to understand that the ban is still in effect and argues it is not the solution to ending illegal mining popularly known as galamsey. Speaking at a press conference in Kumasi in the Ashanti region on Wednesday, 21February2018, General Secretary of GNASSM, Mr Godwin Armah, said the ban has curtailed the legal right of its members who hold titles to mine on their concessions. For him, the members went through the legally prescribed process to obtain their license and should not be prevented from mining activities. He, therefore, finds the ban as discriminatory against members of the Association since the large scale mining companies like Newmont, Perseus and others are regulated under the same mining law but unaffected by the ban. Mr Armah insists that the ban is counterproductive to the promotion of local enterprise development as small scale mining is preserved for only Ghanaians and they have been targeted by the decision to halt mining. He added that the ban has exacerbated the financial losses of its members, indicating that: "the cost incurred by members under the ban period is over $551,000,000 and our cost continuous to increase day by day". He said the temporal ban is also a security concern to the nation since majority of the youth who were into small scale mining have become unemployed. "Government of Ghana with support of the Australian government came up with the Multilateral Mining Integrated Project (MMIP) which all stakeholders were consulted and MMIP document was developed, validated and approved by cabinet and 9th February 2018 was set for the launch. We want to know what the government's road map is, if the MMIP is cancelled, we need to know," he demanded. He admonished government to lift the ban immediately.